Boaters delight!!mins. To caloosahatchee river! !no bridges! !almost a half acre of land-4 lot site! !10,000 lb. Boat lift! !live in this highly sought after community of palaco grande. Rarely available property such as this to be found! !this property has endless possibilities & what a deal. Appraisal came in at $625,000!! Love to entertain you found it. Look no further! !with over 2700 sq. Ft. Of indoor living space this home offers a kitchen that any cook would enjoy!recently remodeled w/granite counter tops, magic broom for easy clean up, new disposal. The master-suite has a sitting area that opens to the expansive beautiful outdoors which is totally private. The master-bathroom has a custom built in make-up vanity (convert back to sink). This home does have 4 bedrooms (office has a closet), along with an ample family-room!! Plenty of storage with-in home & even an over-sized garage extra deep too! Brand new a/c, 15 seer, generator with separate electric panel to connect. Impact upper windows, crown molding, plantation shutters and so much more. Too much to mention. Close to everything!this home is a must see! !this is what florida living is all about!! !call now for your private tour!!! With direct gulf access and just minutes from the caloosahatchee river, this four bedroom, three bath home represents the quintessential swfl boating lifestyle. Enjoy the day on your extended lanai, pool side with an expansive view of approximately 265 feet of canal as your boat sits on the 12,000 lb. Boat lift complete with captains walk, dockside electric, and water cleaning station. Do you like to entertain? This home makes it easy with a beautiful kitchen featuring granite countertops, prep sink, stainless steel appliances and open access to the large family room where you can easily tend to your guests or keep an eye on the family. This home also features granite counter tops in master and guest baths, tile flooring throughout living areas, laminate flooring in the bedrooms and an oversized tiled two car garage complete with a work area for the hobbyist or handyman. Additional upgrades include crown moulding, jacuzzi in master bath, fenced in yard, hurricane shutters, brick paver driveway and pool deck, a fl sun room and more! Located conveniently off del prado blvd. So running errands and doing life are a breeze. Submit your offer today as your private oasis awaits! Don't let the age fool you! With a forward thinking gut-job in the 90's, this home is very relevant today. 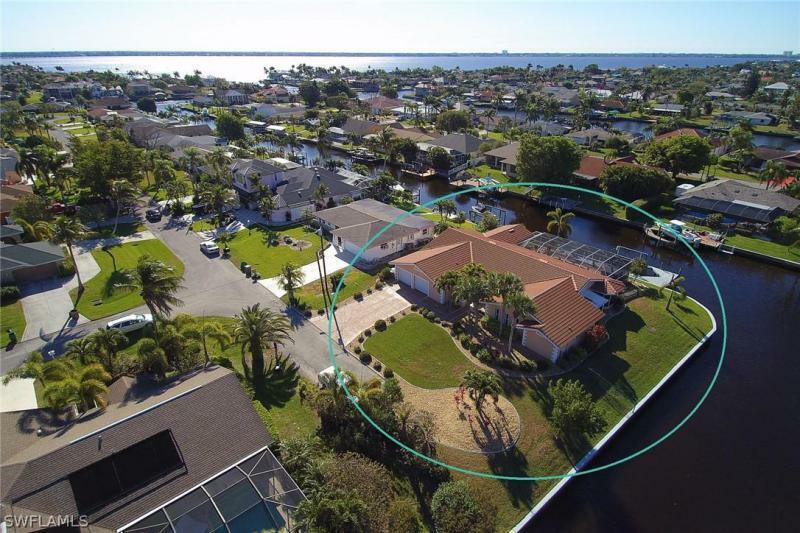 With one of the most incredible views that cape coral has to offer, this sailboat access, single-family 4 bed + den, 3 bath home situated on a lushly landscaped, 3-lot site with a heated pool & spa offers views for 1,274 feet-that's nearly a 1/4 mile of waterfront directly behind this magnificent home! You will appreciate the open, spacious floor plan with the kitchen open to the great room, another huge, open space for the dining & living rooms, rarely available large bedrooms, including a den with closet which allows flexibility for 4 bedrooms+den or 5 bedrooms. Some notable details include: central vaccuum with new hose, gorgeous stained-wood crown molding, windows & french doors, new pool pump, security system, updated pvc plumbing and more! Outside is paradise with lush landscaping, fruit trees, a vegetable garden, and beautiful amaryllis. The seawall is rip rap, and there are 2 docks, including a composite dock. Update it or move in right away-either way this home is filled with opportunities and possibilities! Big family? Huge 4br 4. 5 bath + den gulf access pool home on an oversized lot with a 500 sqft separate bonus room perfect for a gym, movie theater room, game room, mother in law suite, the possibilities are endless. Some of the many other bonuses included with this home are an electric fireplace, bar, vaulted ceilings with gorgeous pecky cypress wood, stainless steel appliances, super sized master bedroom, boat dock and lift, propane heated pool and new landscape. Be sure to check out the virtual tour and add this to your list. Deep water direct gulf-access palaco grande area! If you're a serious boater, better move quick with this home! 4 bedroom, 3 bath, 2 car garage, pool & double-dock lift direct immediate access out to river home in less then 5 minutes. Over $200,000+/- in new and newer upgrades including new roof, new a/c w/ warranty, total front of home has been remodeled. Kitchen has been completely remodeled w/ custom wood cabinets, all stainless steel appliances, including double convection ovens. All wood flooring in living, dining & family rooms. All tile from entry, kitchen, breakfast nook, & bathrooms. Lots of windows & sliders making home light bright & sunny. Free form pool & large pool deck w/ lots of shaded space for family entertaining. Huge captains dock w/ room for 3 or more boats, 70' custom dock w/ 2 lifts (10,000lbs & 20,000lbs) w/fish cleaning station & tiki hut for sunset cocktails, & dockside entertaining. Home is priced close to lot value alone! 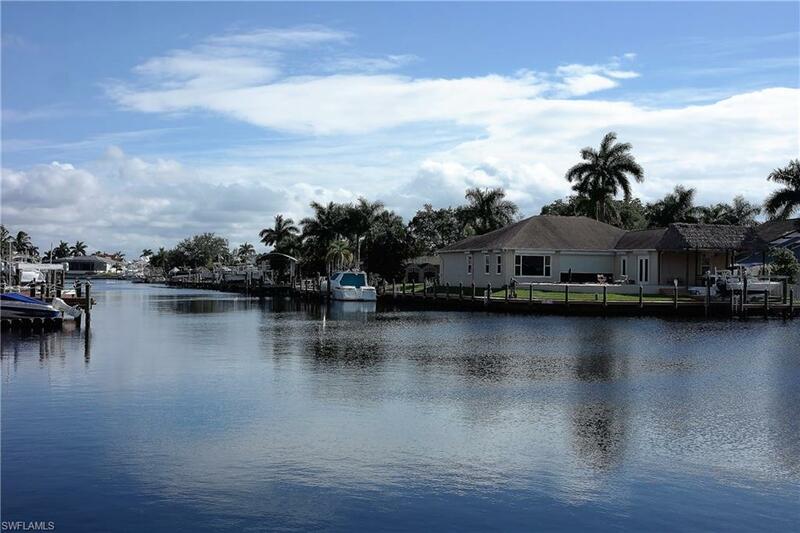 This is a premier best waterfront value property in cape coral. Gulf access 2019 4 bedroom,3 bath,2 car garage on oversized(80x145) waterfront property with intersecting canal view. This home is 2,010 square feet under air with a total of 4298 square feet. This beautiful new house has been completely tiled with fabulous italian tile in all rooms. The kitchen area has upgraded cabinets with beautiful granite counters. High ceilings with 8 ft doors make this property one of a kind. All bathrooms including the bathroom leading to the pool area have amazing upgraded designer tile. This property has an extra large pool deck with large pool. The pool area also has a roughed in outdoor kitchen. Located south of veterans parkway with access to the gulf of mexico. Close to restaurants,shopping,cape coral beach/sanibel beach/ft myers beach and swfl international airport. Direct access to all that southwest florida has to offer! Sailboat access so get ready to enjoy fun in the sun! 10,000 lb boat-lift and concrete dock that has both electric and water. 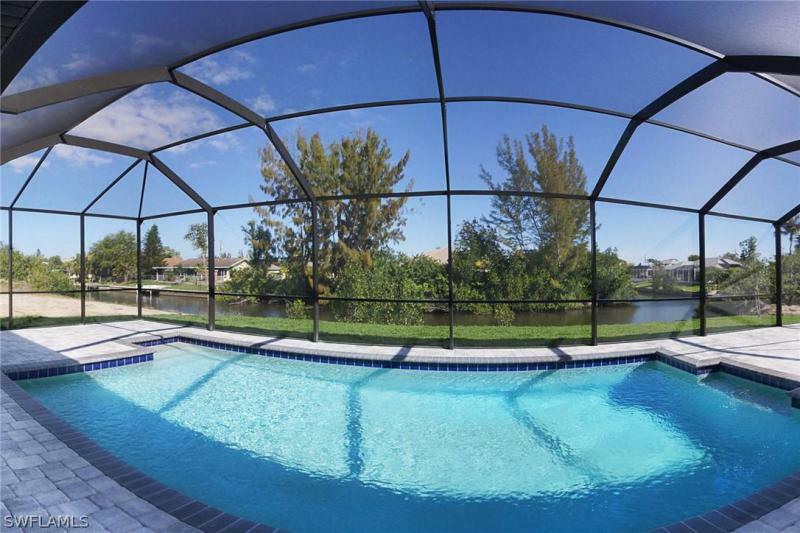 Southern exposed pool has both electric and solar heat, swim year round while enjoying the stunning views of the 200 foot wide canal. Meticulously maintained 4-bedroom, 3-bath home is located in the highly sought after palaco grande neighborhood. Elegantly appointed kitchen. 4 bed + den/office gulf access home a gem with a pool on a 120 ft wide canal. 2236 sq ft living area & 7000 lb boat lift, fish cleaning station water & electric! You will fall in love immediately upon entering this meticulously maintained home by original owner - views right out to pool, lanai & water! They did everything right: new roof in 2018 new a/c in 2011. Updated pool with new pebble interior additional filtration system and relaxing waterfall feature. Plenty of room for sun & fun- all set in a lush tropical setting. Open great room floor plan with 10' ceilings, formal dining as well as a large breakfast nook with views of the pool fabulous recently up dated kitchen w/stylish cabinetry,crown moldings, stainless steel appliances, solid surface counter tops, instant hot water and glass tile back splash. Tile floors with carpet in the bedrooms. A master suite you'll love to escape to - large master bath, spacious walk in closet, jetted jacuzzi tub and walk in shower, double vanity sinks with kick plate lighting and separate toilet room. Ample size guest bedrooms. Wraparound wooden dock with tiki hut for enjoying some shade and a cool beverage on a beautiful florida day. Enjoy waterfront living at its best! 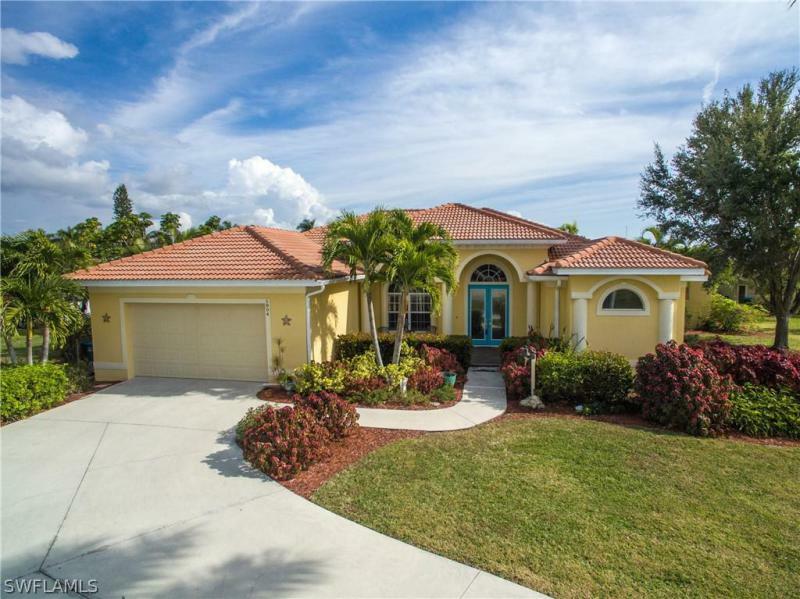 This 4 bedroom, 3 bath, pool home with western exposure is located in southwest cape coral. Only a 5 minute drive to downtown cape coral and the cape coral yacht club. It is a boaters paradise on a deep-water, direct gulf access canal and less than 15 minutes to the river. No bridges or locks. Home is move-in ready and has been meticulously maintained by the current owners. This home offers an open, split-floor plan, 2 master suites and tile throughout. Plenty of space for entertaining guests as the living space flows outside to a spacious lanai, plus a beautiful heated saltwater pool/spa with led lighting, rock and waterfall features. Additional highlights include upgraded 3 zone a/c system (2016) plus enclosed/open option lanai with separate wall mounted a/c, tile roof (2013), new impact resistant windows (2017), new garage door (2017), a 16,000 lb. Boat lift, and a wraparound dock with composite deck. Schedule your private showing today! You will fall in love with this gorgeous 4 bedroom home. A modern kitchen with granite counter tops, stainless steel appliances, and plenty of cabinet space is the centerpiece in this open floor-plan home. New a/c. A newly resurficed pool and a travertine pool deck creates a great outdoor living space ready for entertaining. You will love the easy direct, no bridges access to the gulf of mexico. Perfect for entertaining, located in the heart of cape coral within walking distance to the yacht club beach, shopping, and dinning, where life is not just lived, it is experienced!